Several months ago I bought some adzuki beans with the thought of making homemade gluten-free hoisin sauce and other asian condiments. 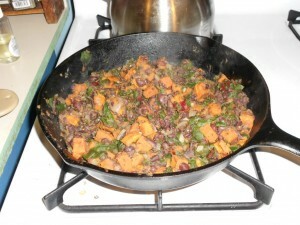 Never got around to that, but last week saw several recipes using adzuki beans over at nourishingmeals.com. Considered a adzuki bean and rice salad, but then our weather got cold, so I went with Adzuki Bean and Yam Hash. I’m not on the elimination diet, mentioned in the recipe, so I made a few minor changes; it turned out pretty yummy and healthy! First, I soaked 1-1/2 cups of adzuki beans overnight. Sources differ on whether or not to soak adzukis and how long to cook them (40 minutes – 2 hours!). I used my never-fail method of starting them on the stove top and then finishing them in the oven. To help with the “beano problem” I rinsed the beans several times after soaking and then threw in a 5″ strip of Kombu seaweed during the last 20 minutes of cooking (mine took 60 minutes in the oven). While the beans were cooking I cooked some brown rice using Saveur’s Perfect Brown Rice method. When the beans were done, I took advantage of the hot oven to bake a large sweet potato. The Adzuki Bean and Yam Hash recipe has you dice the yam very tiny and then cook it in the skillet, but it warns of possible burning, so it seemed easier for me to bake the potato (at least partially) ahead of time. And while that was happening I chopped the red chard I used instead of the collard greens. So, most of my prep work was all done early in the day so I could rest for several hours before doing the rest of the cooking. Heat a large skillet over medium heat. Add the oil. Once the oil is hot add the onions and a dash of salt. Sauté for a few minutes until tender. Add the yams, thyme and cumin. Sauté for a few minutes uncovered and then cover and cook for 5 more minutes (see Note). Stir occasionally and check for sticking and/or burning. Add adzuki beans. Sauté a few minutes more or until the beans are re-warmed, 5-10 minutes. Add the chard. Cover the pan and leave to steam and wilt the chard (about 5 minutes). Sauté everything together. Add Italian Herb blend and pepper to taste. Cooking times will depend in part on whether your yams and beans are still warm (and thus just reheating). Adjust as needed in order to get everything hot. 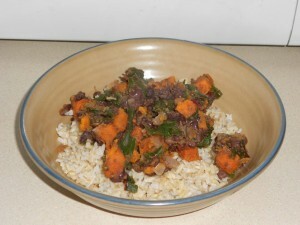 This entry was posted in Recipes and tagged beans, chard, yams by HSG. Bookmark the permalink.